I recently saw a YouTube video featuring a young man who rehabbed a baby squirrel he found caught in a trap. 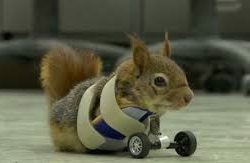 Both the little squirrel’s arms were broken by the trap’s steel jaws and had to be amputated due to permanent nerve damage. But that didn’t stop the feisty furry firecracker; she never lost her incredible will to live. She was fitted with a prosthetic wheeled device, like a teensy wheeled walker, and although she could no longer climb trees, she could happily zip around the ground like her tail was on fire. Her man kept calling her endearments like, “My little sweetie” and “My darling” throughout the video. Awww. That in itself lodged a lump in my throat. For I remembered all too well the time when my heart, too, belonged to a rodent. His name was Ernest P. Squirrel (named after the late great Jim Varney’s goofy character, Ernest P. Worrell, remember him?). Ernest came to us not from steel jaws of death, but feline jaws of death. My calico had cornered baby Ernest in a corner of our garage, intending to have him for lunch. And I don’t mean as a guest. 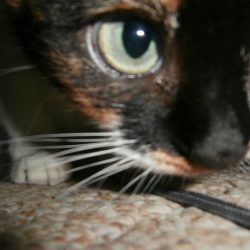 Ernest’s earnest and terrified squeals brought me out of the house, where, horrified that my cat was acting so, well, catlike, I stepped between the hungry aggressor and her victim. 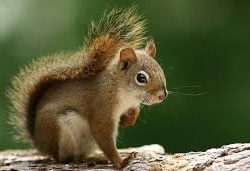 In a flash, that teensy squirrel dashed up my leg – which does bear an uncanny resemblance to a tree trunk – and perched on my thigh, his sharp little claws clutching my jeans. He stared directly into my eyes, his tiny chest heaving. I guess he came to the conclusion that I was a better fate than the cat, for he let me pick him up, cuddle him to my chest, and take him into the safety of the house. And there he stayed for the next four weeks, riding around in my pocket curled up for a snooze or sitting on my shoulder, burrowing deep into my hair. Ernest ruled the roost while growing bigger and stronger on cat’s milk from an eye dropper. Yep, I said cat’s milk. It’s what the vet said to give him because it agrees with squirrel innards and their nutritional needs better than cow’s milk. I just can’t figure out how they milk a cat. Try to picture that, will you? If you’ve ever tried to bathe a cat, you know it would be like trying to tackle the Tasmanian Devil. Do they employ little kitty shackles, claw mittens and snout muzzles while someone squeezes teensy little utters toward an itty bitty bucket? And can you believe cat’s milk comes in handy juice boxes at the grocery right beside the evaporated milk? I kid you not. Something’s ironic about keeping a squirrel alive on cat’s milk when a cat is what almost did him in. But that’s not the point I want to make here. Prior to raising Ernest, I had unsuccessfully tried to rescue two other infant squirrels – one had been ousted from his nest by a hurricane and the other was ushered out by a neighbor’s cat. In my ignorance, I fed the latter one cow’s milk and he only lived a few days. Because the hurricane that stranded the former also closed grocery stores, the only option we had available was human breast milk, which my daughter-in-love graciously donated after nursing her newborn son. Sadly, it just wasn’t the right formula for wee rodents. So this, my patient friend, is finally my point: The only way we can live and flourish is by a steady diet of the right kind of nourishment. In Ernest’s case, cat’s milk. In our case, the milk of the Word. Papa God’s Word. Every single day. To thrive, we need to digest the equivalent of three square meals a day. And we need to consume it ourselves, not simply accept the wad that someone else has already chewed. Soul nourishment is even more important than physical nourishment. Because it affects our eternity. I still have the stuffed squirrel they presented me at the company Christmas banquet that year. I’d love to hear the ways you get your daily spiritual milk. Won’t you take a moment to share with your community of BFFs (Blessed Friends Forever)? 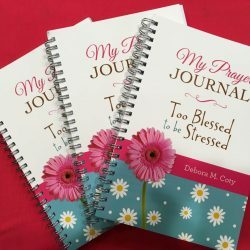 Hey sister, if you need a boost for your daily prayer/Bible reading time, check out my Too Blessed to be Stressed Prayer Journal (available on Amazon.com or CBD online, and I hear it’s now appearing on many Choice book racks); it has great prayer starters and prompts for Bible study and journaling – designed to fit in well with your crazy-busy day. Oh, and this is the last call for beta readers who’d be willing to read and review Too Blessed to be Stressed for Moms, which is releasing this fall. Give me a holler and state whether you’d prefer print or e-version. Many thanks! Thanks for sharing about Ernest P. Squirrel. Jim Varney was from Kentucky and we all loved his hilarious character! I totally agree that God’s Word needs to be consumed regularly and with the right attitude. No fast food mentality. Take the time to read, ponder, and let it digest slowly. I sent you a contact message expressing my desire to be a beta reader. Thank you & Blessings! My kids owned every single Ernest movie, Connie. Even now that they’re grown and gone, Spouse and I watch “Ernest Saves Christmas” every single December! We saved a flying squirrel, who wasn’t as sweet as a regular squirrel. After feeding him round the clock and saving his life, he decided to introduce us to his sharp teeth as he engaged us in a running match while we tried to return him to the wild! Getting God’s Word into our souls is so important. I love being able to have the Bible on my iPhone and always at my fingertips. I just need to remember my glasses! LOL Such a blessing! Ungrateful little wretch. Reminds me of me and how I often take Papa God’s blessings for granted. My teeth can be awfully sharp too. I purchased your book Too Blessed to be Stressed at a time in my life when I needed inspiration and direction. When I finished the book, I felt as if I moved away from a close friend. I was sad and nervous to find a new devotional. Sadly, I have purchased several and none have filled that spot. This book just spoke to me. Even though I am not a mother, I am a teacher to many kiddos. I look forward to your knew book and would love to see one for teachers. We need all the spiritual gup dance we can get nowadays! Thank you for your words. Oh, Kelanie, you totally made my day! Are you referring to the original Too Blessed to be Stressed (what I call the “Mama book” because it birthed the other 30+ books in the Too Blessed to be Stressed line), or my 365-day devotional, Too Blessed to be Stressed: Inspiration for Every Day (one of the offspring)? You might want to check out the one you haven’t yet read; if you like one you’ll like the other. And you know what? To thank you for taking the time to write and encourage me, I’d like to send you a copy of one of my other books that is now out of print; just need you to pm me your mailing address. I will stop right now and lift up a prayer for you and your ministry to your student kiddos. Hugs to you, dear sister!